On Thursday 17 October some members of this group travelled to Plymouth. The exhibition ‘Artists make faces’ is on display at this gallery until 7 December. This group of works of art is curated by Monika Knight and includes a distinctive and personal selection of exhibits. There was an exhibition at Falmouth Art Gallery recently, called ‘Making Faces’. This was a completely different collection, albeit with a similar theme. Some confusion probably arose because of the similarity of the titles. I, for one, believed that I was going to see the same exhibition again, until I arrived at the Plymouth gallery. Both displays were diverse and original. It was interesting to compare them. Napoleon and his Daughters, 1975 by Sava Sekulić. Women in Art was the theme of another temporary exhibition, which contained a selection of works from this gallery’s permanent collection that portray or were painted by women. The topic of women painters could provide a theme for discussion in the future for our group. There are many rooms to explore in Plymouth Art Gallery. The China Collection on the first floor is beautifully and clearly displayed, with informative and well presented facts about the history of china. To mention only one more exhibition here, the Cottonian Collection shows the diverse collection of an 18th connoisseur. Next year, this venue is to host the exhibition of the works of Dame Laura Knight, currently showing at the National Portrait Gallery in London. Our group plans to visit this particular exhibition when it arrives in Plymouth. Programme for the next few months. 17th October, trip to Plymouth Art Gallery by train. Leaving Lostwithiel at 10.50, returning on either the 15.57 or the 17.23. 29th October, Penlee House Gallery in Penzance. Graham Sutherland – From Darkness into light, Mining, Metal and Machines. 7th November. St Austell Cinema. The Habit of Art. Also on 25th November the Film Club is Lostwithiel is showing Summer in February about the Newlyn school of artists. Nothing planned for December. Maybe we could meet for a social evening in the Globe. January 20th Penlee House in Penzance. Etchings by Edward Bouverie Hoyton. 7th February Group meeting. Venue to be decided. Other suggestions were an exhibition in Taprell House, entitled Personal Art, a display of our own personal favourite picture and what they mean to us. The trip to Florence on 11th March has hit a problem but Pat Stearn still working on it, so watch this space. National Theatre's production of Alan Bennett's funny and heart rendering The Habit of Art features acclaimed performances by Richard Griffiths, Alex Jennings and Frances de la Tour. Benjamin Britten receives advice from his former friend WH Auden in an intriguing reflection that gets to the heart of music, theatre and, fundamentally, the habit of art. Visit to Penlee House Gallery. On 19th July 6 of the group went to an exhibition at Penlee House Gallery in Penzance entitled Poems, Plays and Fairytales. This was a series of paintings by the Newlyn school of artists inspired by literature. 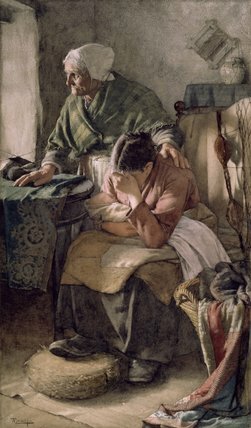 One of my favourites was by Walter Langley called But Men must Work and Women must Weep. This is based on a poem by Charles Kingsley called The Three Fishers. It depicts two women, one old and one young who sit by the window of their cottage. The young woman faces into the room, unable to look out of the window at the sea. Her head is bowed, she looks hopeless, just maybe her man will be safe. The old woman looks out of the window. She has seen it all before, she is resigned. Her knitting is abandoned on the window ledge, the circular needles fashioning another guernsey, that will never be worn. Who is it this time; a son, a son in law? We don’t know, but we know that tragedy is there. I know the poem well as a folk song but never knew who wrote the words. hers depicts the Pied Piper of Hamelin. This one again a procession of children, but the mood is dark. Some of the children look in a trance, some scared being pulled along by the hand. In the distance is the bent and sinister figure of the pied Piper. It would have like these two paintings to have been shown together, side by side, to emphacise the contrast. It is impossible to comment here on the full exhibition. Needless to say we spent a long time in the gallery and were glad afterwards to sit outside in the sunshine of the garden and enjoy our picnic lunch. It was an enjoyable day spent in good company. On 23rd July some members of the Lostwithiel U3A Art Appreciation group travelled to Truro to see the play The Pitmen Painters at the Hall for Cornwall. This dramatic work was ideal entertainment for our group and can be recommended for anyone who enjoys stimulating theatre. The play is based on a true story of some colliers in Ashington who, in 1934, embarked upon an art appreciation course. From a starting point with no knowledge of art whatsoever, these miners soon found a strong urge to create art themselves. Much of their work generated excitement and admiration amongst contemporary artists and collectors, yet their lives working down the pit continued as before. Many issues are raised - politics, social class boundaries and, above all, the meaning of art. Often philosophical in tone, the play is interlaced with laugh out loud humour. The use of dialect speech is particularly humorous and itself highlights the intense social divisions of the period. The Pitman Painters is a thought provoking and enriching play. Our group left the theatre with the feeling that we had learned something worthwhile whilst being extremely well entertained. U3A Art Appreciation Group trip to Taunton. Four members of the group travelled by train to Taunton on Tuesday to visit an exhibition called Earth, Air, Fire and Water. Subtitled Somerset Artists in Their Element, it contained paintings in oils and water colours, and egg tempera; prints; etchings; stained glass; wood carving; photography; sculpture and pottery. All the artists had been inspired by the Somerset countryside and many of them work out of doors. The artist working in charcoal makes her own willow charcoal and the artist working in egg tempera keeps chickens so he has a ready supply of eggs! I was particularly interested in the three paintings by Luke Piper (grandson of John Piper who designed the stained glass windows of Coventry Cathedral. Luke is interested in the Mary and Michael energy lines, and the way they shape the landscape, which run from Marazion to the coast of Suffolk and which pass through St. Barts Church in Lostwithiel. He has painted landscapes all the way through Cornwall and Devon and hopes to mount a complete exhibition when the series is finished in 2014. After spending a considerable time browsing this exhibition we had a quick look at the rest of the Museum of Somerset which proved very interesting. After enjoying a delicious lunch in the museum’s courtyard café we made our way back to the station for the return journey. The exhibition runs until 6th July and is well worth a visit. Entry is free. General agreement that we would define Art as widely as possible and see and learn about new areas as well as those we already like and love. That we would try to visit an exhibition, gallery, stately home with collections,have a speaker,someone to show their collection every month. That after the first visit, more later, whoever had the idea or contact would make the arrangements and that for the moment Jenni would act as the contact in the short term. However if someone organising an event had the contact list then they would be able to do the mail out. Should I send everyone the contacts or just as the need arises? We could between us provide transport to venues. It was also agreed that we would have a first visit to Lanhydrock house to explore the collection there and that this would be during late March/April. The second visit would be to the preview night of the Lostwithiel Art group at Library on 6th May. More info later. Then in June a visit to a gallery to be arranged by Chris. Other possible events were the idea of a “show and tell” event. Each of us sharing a picture that was of particular interest or importance to us and maybe talking about why. Looking at POP Art with Mike Dobbie. This was thought to be a good idea for later in the year when the weather was not so good. Mike Dobbie is happy to do this for us. Each of the group would do some research about what other events, exhibitions were available during the year. I have discussed it with Paul Holden, collections manager and he is happy to do “an Introduction to the Collection” tour for us but has to clear it with the House manager. I have asked him to give us a date accepting that inevitably there will be some of us who can’t get there. WE will have time after for coffee and cake. There will probably be a small charge for the tour. There were 2 events of interest in the Guardian this week. A Century of St Ives Art. An exhibition at the Royal Cornwall Museum which looks as if it is running until November. Also Port Eliot has “Marking the Line”Ceramics and Architecture. A group of leading contemporary ceramic artists will fill some of Soanes finest rooms with new work inspired by the architect, his creations and collections. May 22nd-July15th. Small problem about getting this info to those who have no email without long telephone conversations. I guess post is the easiest unless any of you can pass a copy on. Let me know.